This can lead to slips and falls, an unclean environment and the risk of forklifts skidding. But according to MATS 4 U, there is a solution – Waterhog Forklift Mats. 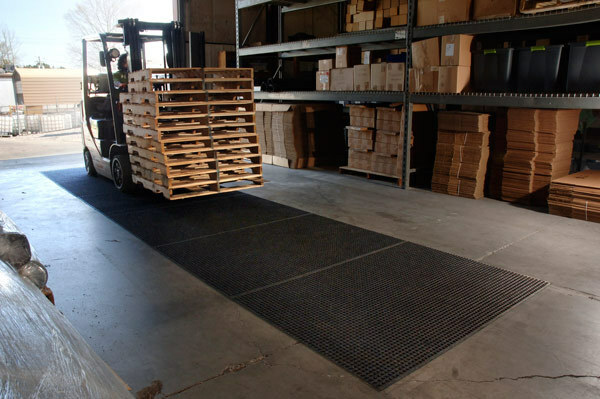 Forklift mats are designed to scrape and wipe forklift wheels as they drive over them to prevent dirt and water being tracked inside and around the warehouse. By drying the wheels this can also prevent forklift trucks from skidding and damaging fixtures, fittings and goods. They are designed to make your facility or warehouse both safer and cleaner. Waterhog Forklift Mats have a crush proof, bi-level construction which withstands the weight of a loaded forklift and holds the dirt in the mat, where it can easily be cleaned away at the end of the day. The latest edition of the range, Waterhog Modular Forklift Mats, is a modular system, that is easy and quick to install with a tough double-sided tape, with a downtime of less than an hour. Dirt and water in your warehouse?